"I am particularly interested in communicating with folks interested in (1) North Shore, Long Island, New York local history with emphasis on Roslyn and Harbor Hill, (2) Mackay Art, Armor and Tapestry collections and (3) submarine cable, over-land telegraph and early ship-to-shore radio history with emphasis on the Commercial Cable Company, the Postal Telegraph-Cable Company and the Mackay Radio Company. First of all, my interest in researching Clarence H. Mackay, comes from a fascination with exploring Harbor Hill as well as his life and times (1874-1938). Upon rising to prominence as the son of John W. Mackay, one of the world's wealthiest 19th Century mining and tele-communications magnates, Clarence and his family were written about on a daily basis in all the newspapers and magazines of his day. Clarence had an international reputation as a business man, sportsman, and patron of the arts. But since his death in 1938, no one has published a biography of the man himself. How did such a man of prominence slip from the scene with so little notice from a once infatuated public? As a teenager, growing up in Roslyn, New York in the 1950s, my family and I lived near the family of Sarah (Letson) Marshall. Sarah's father, Peter Letson, was the head dairyman for the Mackay Estate at Harbor Hill from 1914 until the estate closed 24 years later in 1938. Sarah grew up on the Mackay estate and lived in the Dairyman's cottage that still stands at 42 Elm Drive in "Country Estates" today. My parents were also acquainted with Ted Mackie, Mr. Clarence Mackay's personal chauffeur and valet. Ted was such a valued employee of Clarence Mackay that he was bequeathed a sum of money at Mr. Mackay's death in 1938. When we knew Ted and his wife in the 1950s, they owned a historic old home in Roslyn Village that dated back to the late 1700s. Ted Mackie may well have driven the big La Salle sedan depicted on Mackay Stories, p.3. Secondly, my interest in researching the Commercial Cable Company, the Postal Telegraph-Cable Company and the Mackay Radio Company stems from the fact that these three companies were begun and operated by either John W. Mackay or Clarence H. Mackay. With the advent of the Mackay Radio Company in 1925, Clarence Mackay was the first person to integrate undersea cables, land telegraph lines and radio into a single communications system. Very little is found about these companies today. Hopefully, there are folks today that have first, second and even third hand stories to tell about these things. I look forward to hearing from you and with your permission, will place your remembrance or story on this website for all other interested researchers to read". 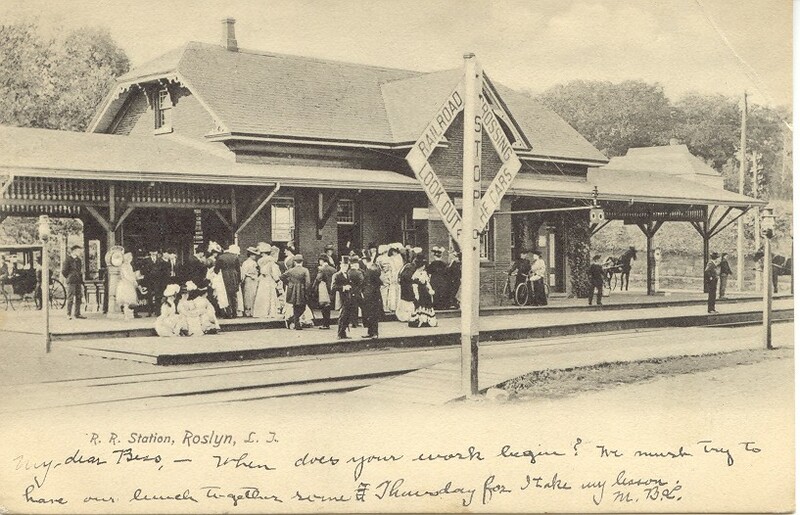 1907 view of the Long Island Rail Road Station in Roslyn near the Mackay Estate. The LIRR was the quickest way to travel between Roslyn and New York City. Other alternatives? Horse and carriage, early motor vehicle or the steamboat from the Steamboat Landing in Roslyn Harbor to Peck's Slip, Pier 24, East River, New York City (a 3 hour trip each way). 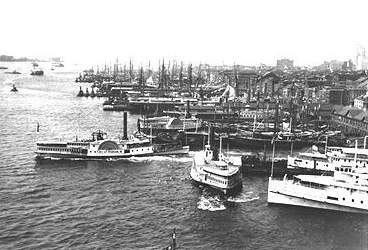 East River traffic in the days of steam and sail. CLICK HERE to go to Contact Page to Send Feedback to Bill McLaughlin Concerning this site.